Single row angular contact ball bearings are self-retaining units with solid inner and outer rings and ball and cage assemblies with polyamide, sheet steel or brass cages. The raceways of the inner and outer rings are offset in relation to each other in the direction of the bearing axis. The bearings are available in open and sealed versions. Their self-alignment capacity is very small. Many sizes of angular contact ball bearings are supplied in X-life design. These bearings are indicated in the dimension tables. 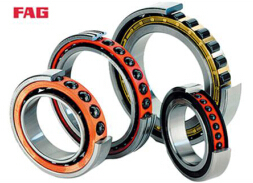 Bearings of X-life quality have an improved raceway geometry as well as optimised surfaces. This gives a significant increase in the fatigue limit load of the bearings. In calculation of the expanded adjusted rating life, values up to 50% higher are achieved. In certain applications, a smaller design of bearing arrangement can therefore be used if necessary. Double row angular contact ball bearings are units with solid inner and outer rings and ball and cage assemblies with polyamide, sheet steel or brass cages. They correspond in design to single row angular contact ball bearings in pairs in an O arrangement but give a narrower design than these. 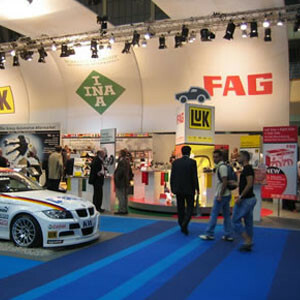 They differ in the size of their contact angle and the design of the bearing rings. The bearings are available in open and sealed versions. Due to the production technology used, open bearings can still have turned recesses on the outer ring for seals or shields. Sealed bearings are maintenance-free and, as a result, allow particularly economical bearing arrangements. The self-alignment capacity of angular contact ball bearings is very small. Four point contact bearings are single row angular contact ball bearings and therefore require significantly less space in an axial direction than double row designs. The bearings comprise solid outer rings, split inner rings and ball and cage assemblies with brass or polyamide cages. Due to the two-piece inner rings, a large number of balls can be accommodated. The halves of the inner ring are matched to the specific bearing and must not be interchanged with those of bearings of the same size. The outer ring with the ball and cage assembly can be fitted separately from the halves of the inner ring.